It has been the naval architect Marc Lombard himself who awoke my interest in RM Yachts: When I got the chance to meet him during the Boot boatshow in Dusseldorf this year to talk about the very process of designing a sailing yacht and his personal approach (read the article here). 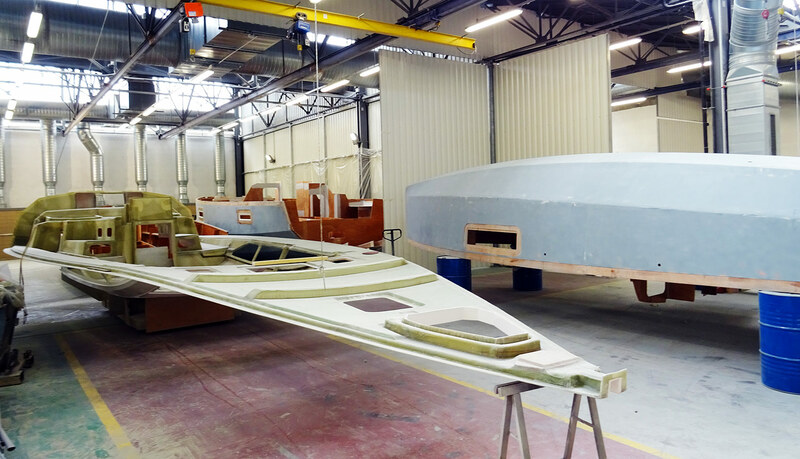 He directed me to the stand of Fora Marine – RM Yachts where we sat down to discuss the topic. It was here when I first heard about the fact that a yacht builder is making big and yet fast sailing cruisers from plywood. I can´t wait to see how these beauties are made! One part of the big workshop. “This is how it all starts”, she says pointing to a storing area: Large piles of plywood of all sizes and thicknesses are stored here, some piles made of pre-cut parts for the boats. “The parts are laser cut”, Justine explains. I can see what will be future portholes, stringers, parts which will form a bulkhead of a yacht. Where do these raw plywood sheets come from? “They are made especially for us nearby. Also the laser cutting service is performed by a local company in the area around us. We try to have most of the boat done by ourselves of course. If this can´t be done, we are always seeking the help of local companies first.”, Justine explains. Building a yacht is hand labor. Always. 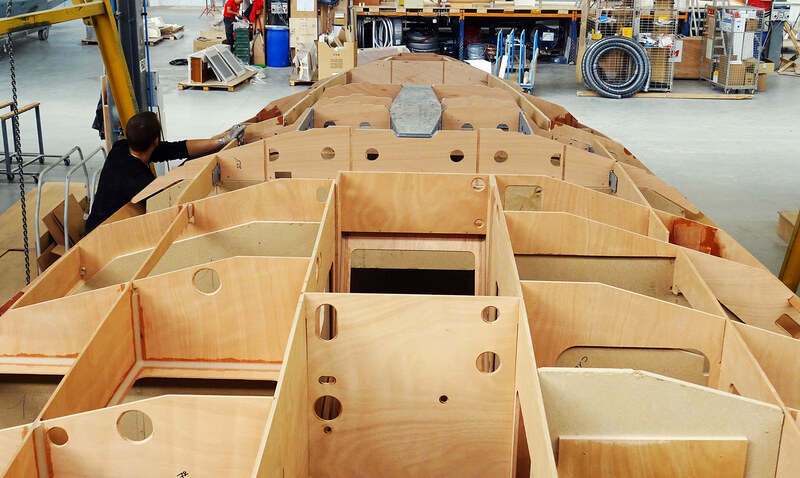 Making a plywood sailing yacht is – not unlike the building of a GRP boat – a lot of hand labor. When I was visiting the yard it was bristling with people. What I liked a lot was the fact that I equally saw young people working here as well as elder craftsmen which is a sign of a good healthy workforce and the ensuring of knowledge transition between the generations. There appeared to be no pressure here – people did their work thoroughly, I often saw them putting away the tools to intensively check on the outcome. All of the male workers of course found their time to greet Justine with French bisous as well. The parts are then glued together by means of Epoxy. 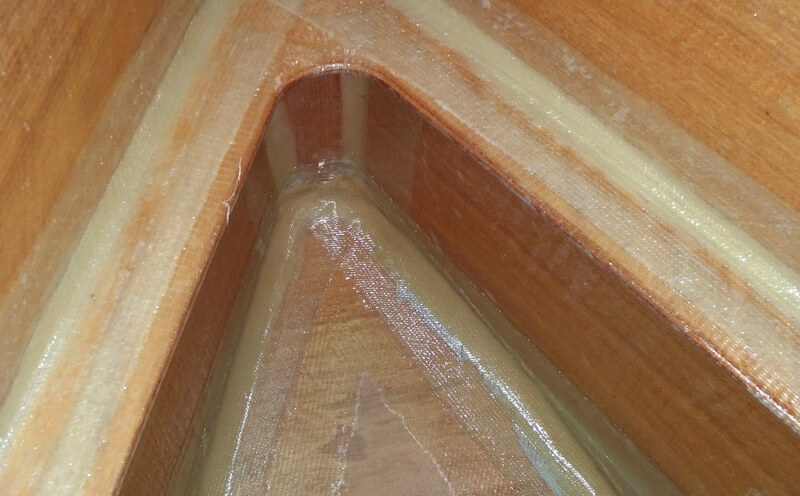 “We are using a lot of Epoxy in our yachts of course.”, Justine says pointing to the thick joints of the plywood plates: “Epoxy is the best glue in this matter as it will be virtually sucked into the plywood material. It will form a very, very strong bond with the wooden parts no other glue will achieve.” They use different forms of Epoxy here, I will learn later. Looking at the joints I notice the sheer thickness of them: Not as thick a thumb, but as thick as two thumbs! It´s funny to see that there are no nails, no screws no bolts and nuts whatsoever needed to form the structural skeleton of this yacht. 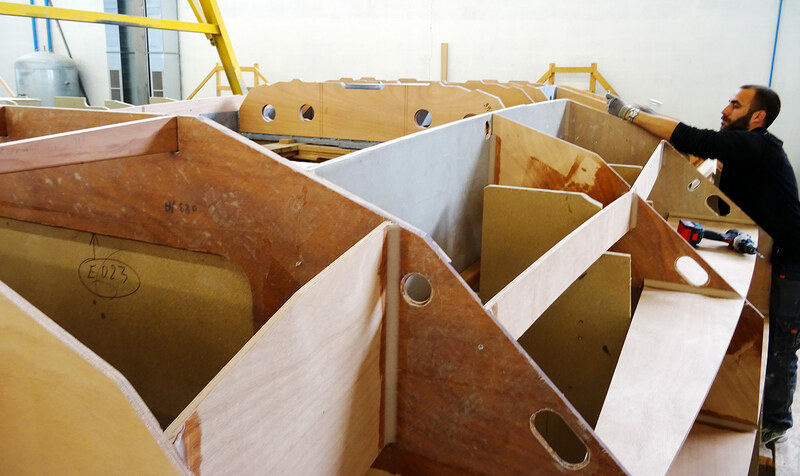 Looking at the huge strains which will go into a yacht´s hull when sailing, when the shrouds are under immense loads, when waves pound the hull, it´s just amazing to see that there is not a single bolt needed to support the wooden mainframe of an RM Yacht. I crawl deeper into the huge 3D-puzzle to look thoroughly. 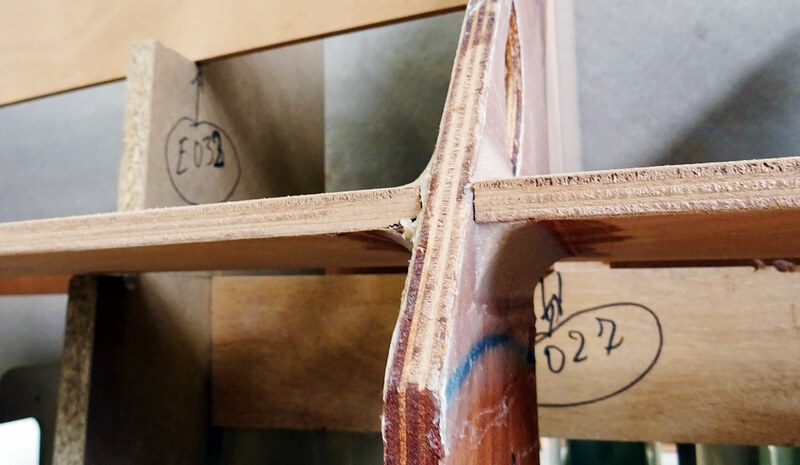 All joints are glued from either sides to the adjoining parts, the quality of the joints is as high as expected – no seams visible. Even the Epoxy glued areas – though made by hand – seem to have been done by a robot as perfect and even as they appear. 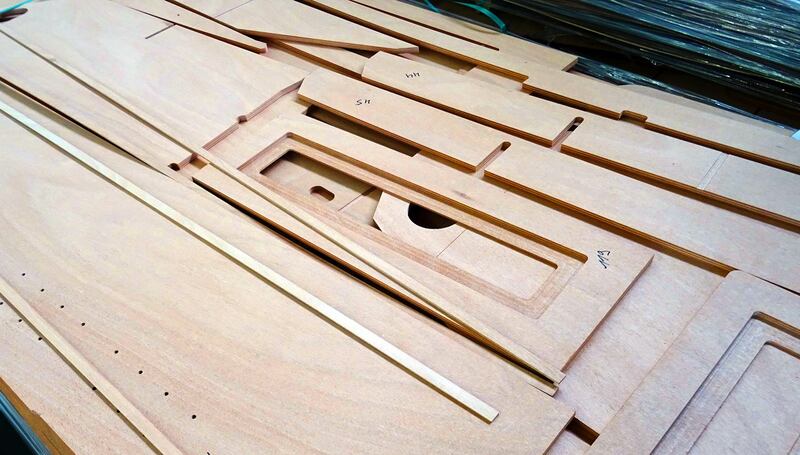 Thanks to a precise laser-cutting technology this boat will be as symmetrically perfect as one could think of. I wonder how long it would take to fabricate a plywood yacht hull. 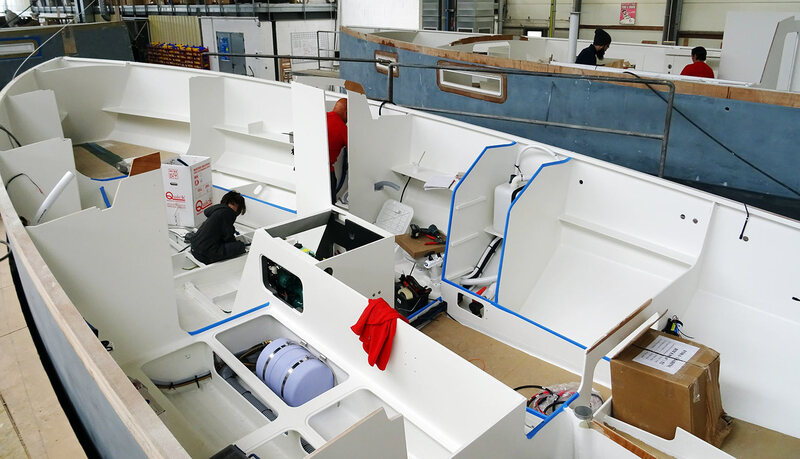 Justine is asking a worker how looks at the construction and estimates: The large boats, 10 to 12 meters, will take a good week to be made, the smaller, 8 to 9 meter yachts are faster: “The hull of an RM 890 will take three to four days in this production step.”, Justine translates. Wow, that´s fast for sure, faster than molding (and drying) a GRP-hull. 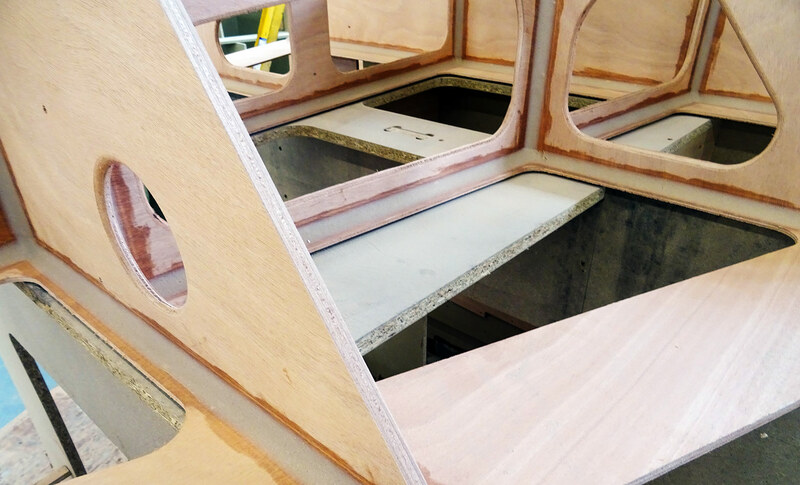 Plywood – this word may for some people sound odd in connection with making a proper oceangoing yacht. You could use plywood for furniture or panels, but could you use it to make a ship that is sailing on the Oceans and withstand the sheer forces of nature? These boats all have Cat A CE-rating and are thus made for sailing in all conditions in all areas of our planet. The boats needs to be strong. How do they achieve it? Before I enter the large workshop-hall I take a look at a steel frame unit ready for assembly outside. 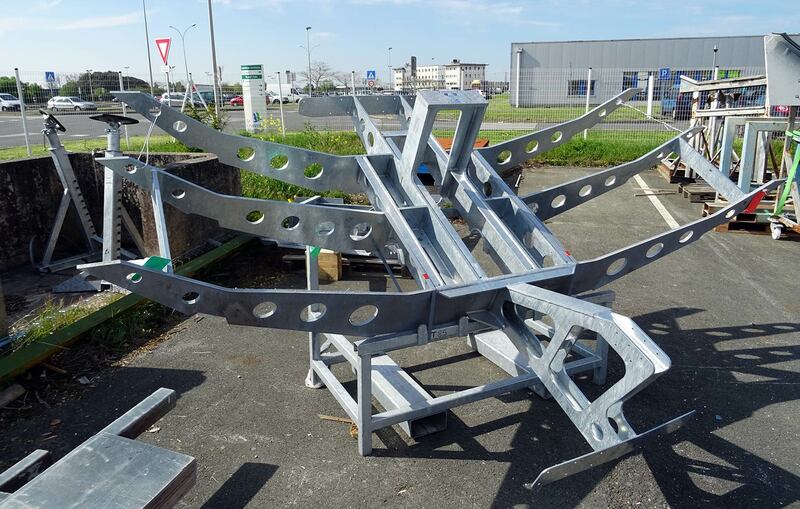 That´s a thick piece of stainless steel, not dissimilar to those massive main frames for example X-Yachts is utilizing in their respective yachts. “This cage is also done by a partner company in this area.”, Justine explains: “Every RM yacht has one of these built in.” The steel has a thickness of some 10 millimeters. I take a look under one of the hulls and can clearly see how the steel cage is built in. Most of the steel-parts have been covered with plywood, others had been bolted to thick plywood stringers of the hull. The cage is securely attached to the wooden structure: “The second purpose of the steel cage is to take on the loads from the shrouds which will be diverted directly to the steel.”, Justine tells me. All in all the hull makes a deep impression on me. On the one hand I am fascinated by the plywood construction, the thick joints and the perfect seamless assembly, the effort that goes into each and every part of the structure. When I touch the structure or knock on it, it feels solid and the “Clang” of my knocking reassures me of the solidity of the hull. On the other hand … it´s still plywood, isn´t it? What about collision damage on a plywood yacht? As we roam the workshop, I do ask Justine some further questions on stability of the boat. What about collisions? Hitting floating object is a nightmare for every skipper and whilst the sea gets more and more polluted, yards need to find answers. Of course, she says, that´s a problem for every yacht maker and RM Yachts has an answer to this one too. 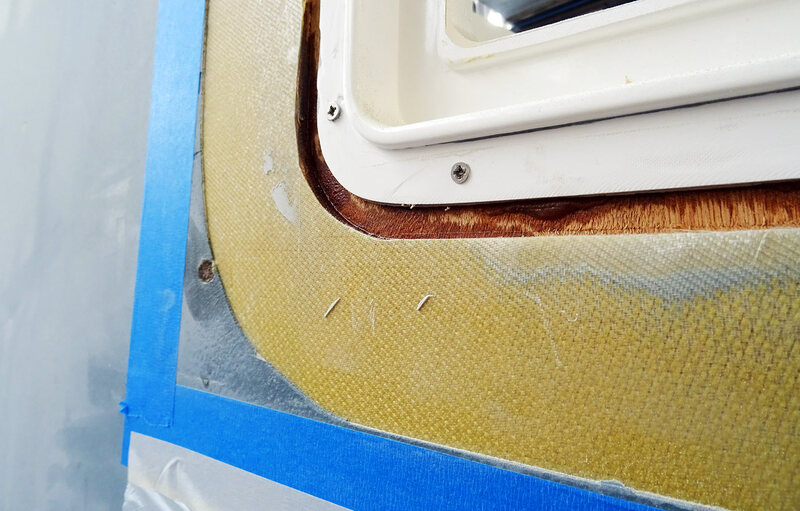 Making the raw hull “harden” through Epoxy from the inside. A tedious job. I go down to my knees and look right into the collision compartment (which will house the anchor-chain and gas-bootle) later. There I can see what she meant. I can further see some solgitudinal stringers which will add further strength in this area. Seems appropriate and to be honest, it looks a lot more assuring that some GRP-made hulls I had to inspect where there isn´t any of these elements but just 0.8 centimetres of GRP. 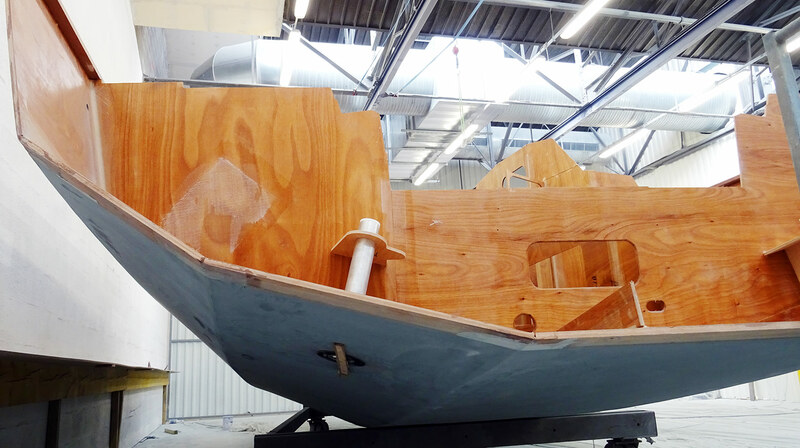 Marc Lombard told me during our interview that plywood is the ideal material to make a ship because of a certain feature of it: It is soaking itself automatically with Epoxy if done right. Justine gets me deeper into this: “When the hull is completed on the stand, it will be completely painted with Epoxy resin. 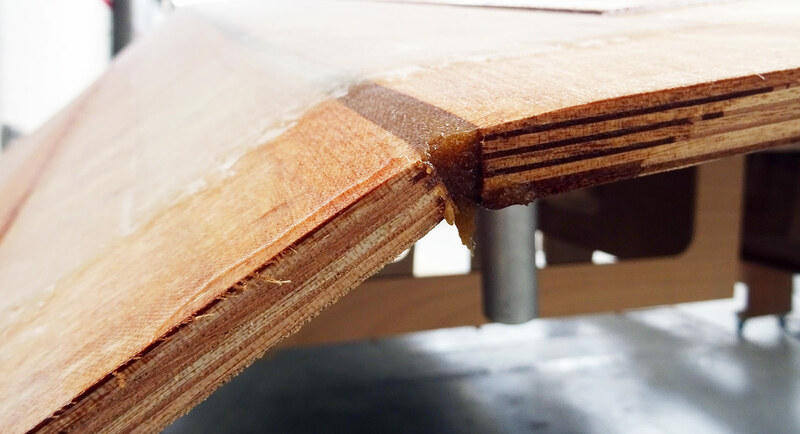 As plywood is naturally made of a more softer timber, the material will literally soak itself full of resin instantly. When drying out, the once soft plywood will then be a rock solid new material. And this is what we want to achieve.” Again under one new hull I watch a worker doing exactly this job. Very tedious, on your knees for hours and re-doing the joints, painting the inner hull with Epoxy. The nice smell of wooden material in this area of the workshop is of course instantly replaced by the familiar odour of resin and chemical agents helping to stick to the material and dry fast. 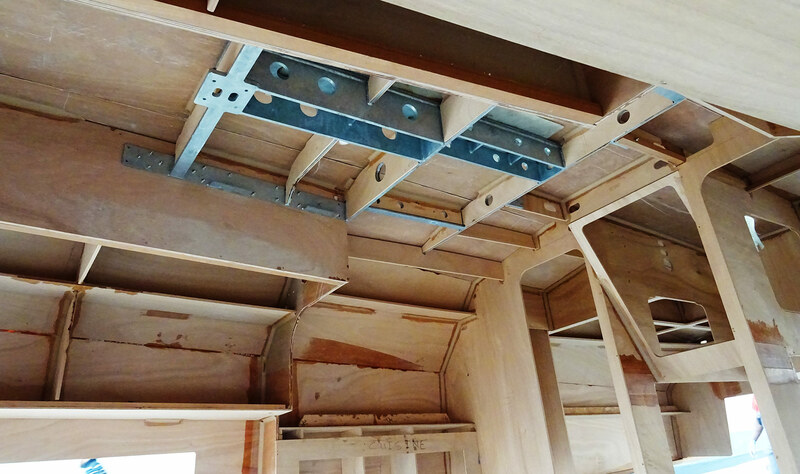 Of course, plywood-made hulls cannot bear round shapes like it is achieved with a GRP mold. RM Yachts are therefore hard chined hulls. Naval architect Marc Lombard sees no problems in that especially in view to most of the contemporary GRP-hull concepts which themselves feature more or less extreme developed chines to gain more volume. 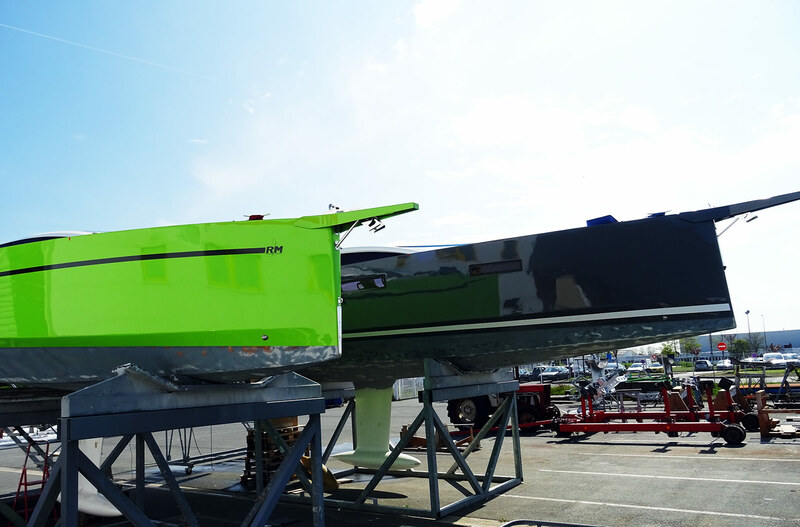 For performance-oriented hull designs like this of a Pogo for example a chine will add sufficiently to the stability of the yacht when sailing heeled. We enter another section of the complex. Huge fans are constantly taking out and filtering the air from dust particles. Air condition keeps the hall inside a certain small range of temperatures so that an optimum surrounding for the very working steps is created which are performed here. Looking at the hull very closely, I notice the thickness of the Epoxy layers which is in some areas well more than 3 millimetres. The sanding process – which is a very, very nasty work, hazardous for the workers (that’s why they have to wear dust masks and the air is immediately filtered through the large machines, a loud work and a nasty work as I know from my own experiences with sanding GRP surfaces on my own yacht (read it here). Looking at the stern of this hull I notice the different strengths of the thickness of the plywood sheets forming the hull itself: The bottom sheet clearly is thicker than 2 centimetres, going to the outside and up the hull to the ship´s sides the sheets get thinner, but no thinner than one centimetre. 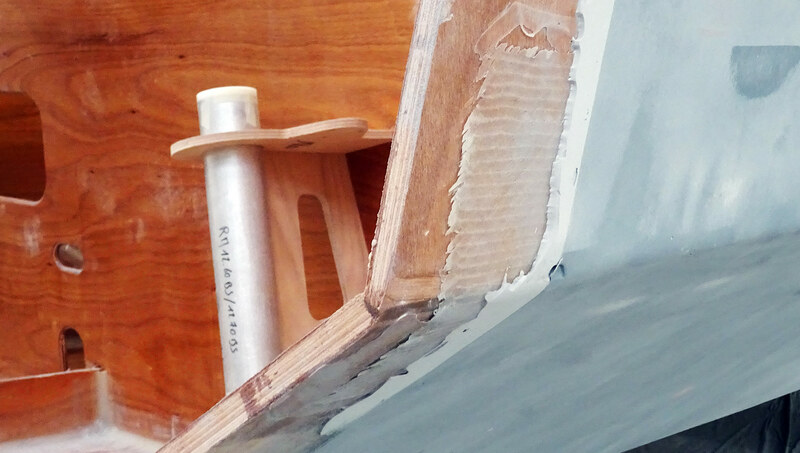 Sanding work has been done just fine on this hull: The once “hard” chines are now rounded to a nice and soft shape. 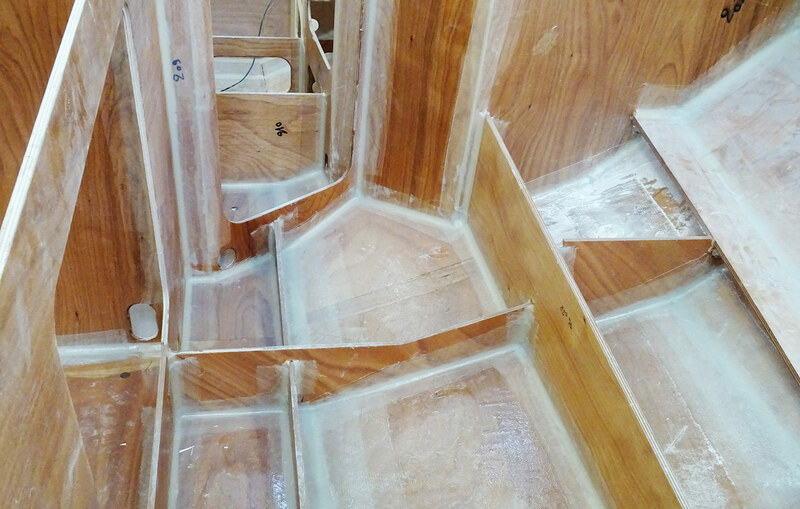 Here it is where I can finally take a look at the finished raw-inside of the hull with all of the plywood soaked with Epoxy, the adjoining areas laminated twice for additional strength and everything covered with another single layer of GRP-garment. Looks rock-solid and walking on the hull is no problem: No squeeking nor any other sound coming from the surface when walking on it. 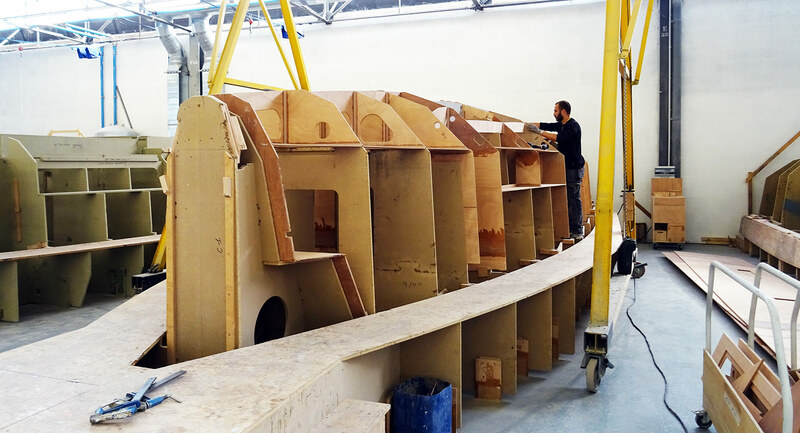 Of course, RM Yachts are no complete plywood boat. This is what I understand now. 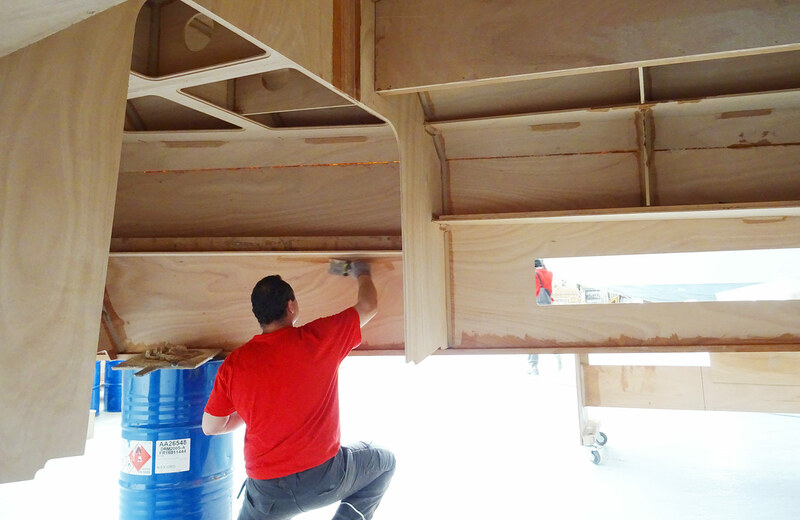 The basic material may be plywood, but the construction bears nevertheless a significant portion of modern-day materials just like Epoxy resin and different types of GRP-garments. 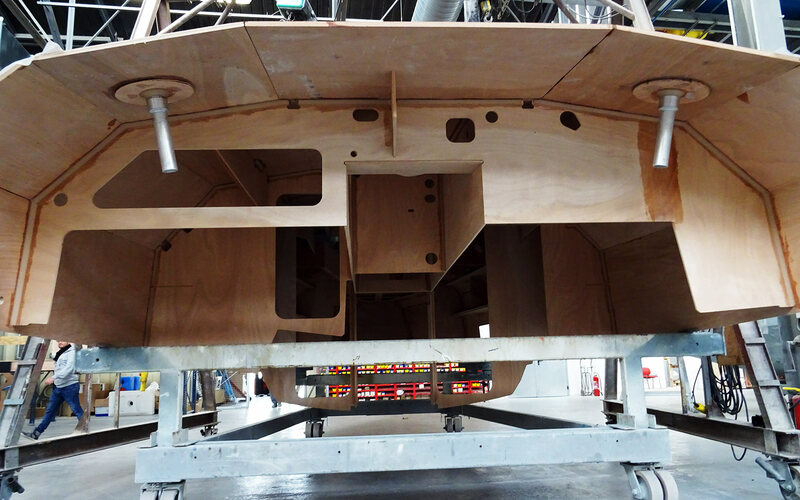 As Marc Lombard told me during Boot boatshow Dusseldorf, the one and only part of the boat that is made the “traditional-modern” way in a mold is the deck. 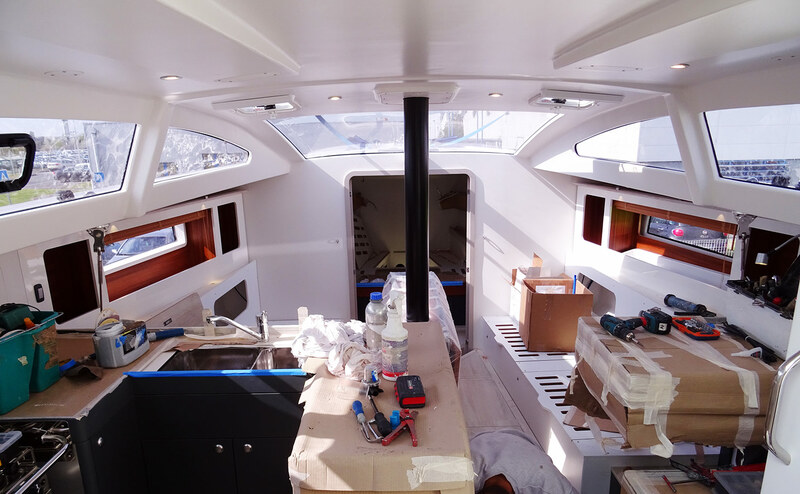 “You cannot achieve nice round surfaces and forms with plywood”, he said: “We just want to offer not solely a fast sailing hull but also sailing pleasure which derives from a large portion of the comfort a cabin offers.” Marc explained that the deck will be done traditionally by hand-laminating a GRP mold. And this is what I see at the next station. “These decks are done at a nearby shop by another local partner”, Justine tells me as we walk by. 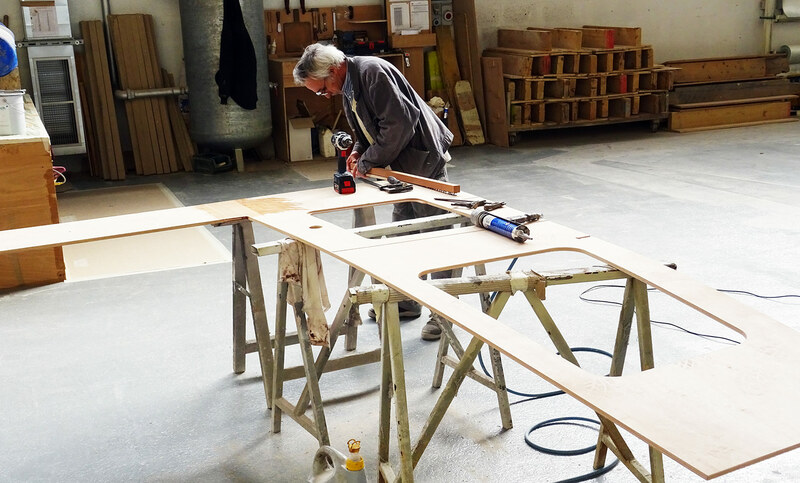 “Salut!”, we greet loud and clear as we enter another part of the hall, the joiner´s workshop. Now that´s the smell I love indeed! Wooden parts are sawn, sanded and worked with so that it scents like being in a forest here. “Now the GRP molded deck will be outfitted with wooden parts as you may see here.” This could be interesting, I am thinking for myself, since I am right now working on my own yacht on the roofing. What a great idea to use Velcro-fastener for attaching the roofing panels! Just as I did it on my own King´s Cruiser 33, the workers are glueing wooden parts to the ceiling which will later be the substruction to take on the roofing panels. Wiring for lighting and other electric installations are already attached to the roof. And there it is: My inspiration! Velcro-tape is used to hold the roofing panels, at least as a secondary joining point. I am taking this idea for my own project since my roofing panels are somewhat heavy and very long – utilizing Velcro will make working with it a lot more easier. 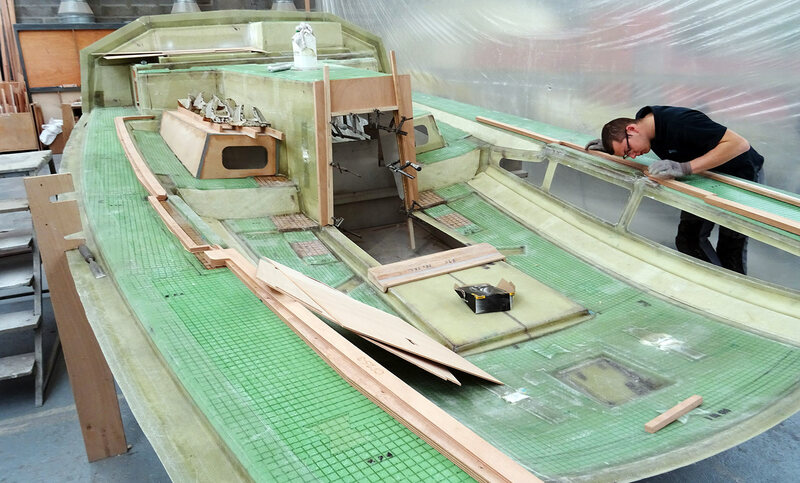 At the same time, the hull – readily painted in the inside – is brought to the assembly line. “Now you can see we have painted the internal hull completely white.”, Justine shows me a 970-hull. “It´s no different in her appearance from a GRP-molded hull anymore and you won´t see any plywood.” Which is perfectly true. The white paint has been applied flawlessly and workers are busy installing machinery, wires and tubes. 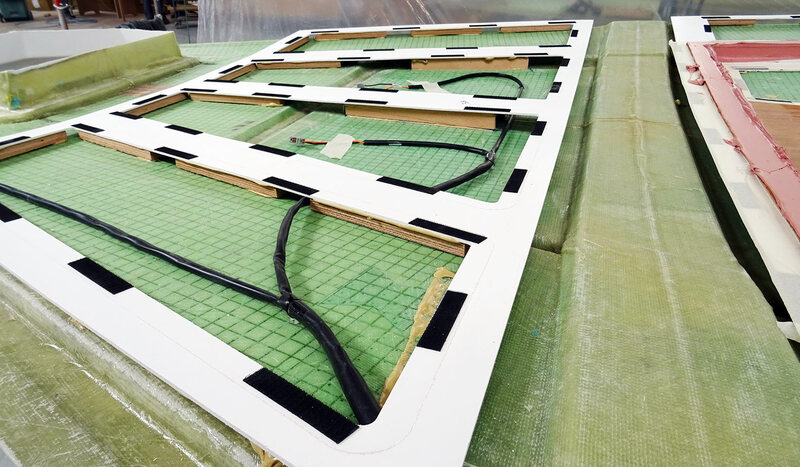 “Finally, after the marriage – when the deck joins the hull – the yachts will be brought here and all connecting areas between hull and deck will be closed with multiple layers of this thick Epoxy.” The deck will be attached in two ways at the same time: The deck will be glued with Epoxy to the hull. That’s why they had built a wide strip at the edge of the ship´s side so that a large area is formed to glue the deck onto. Second, thick nuts and bolts will be drilled through deck and hull every 20 centimetres to form a solid mechanical bond. With this step the boat has been finished to a raw state. All major pats like engine, additional machinery, all electric wires and parts had been already installed. 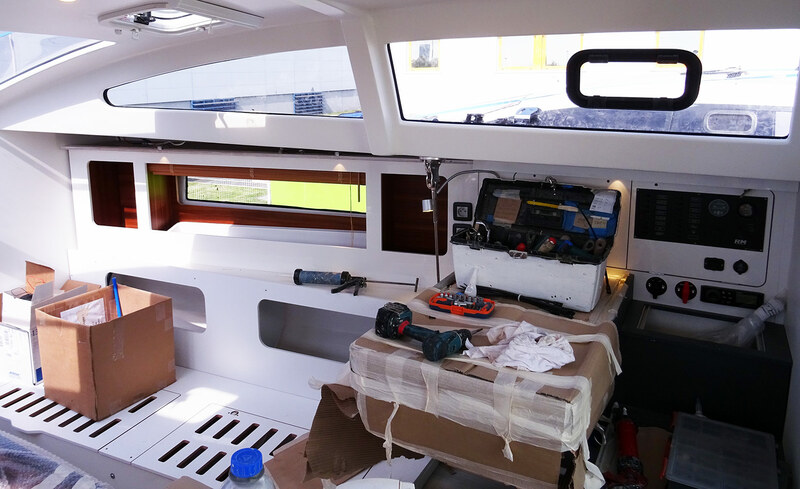 Most of the joinery is of course assembled and put into the boat before the marriage of hull and deck – just as it is the case with all yachts. “Now the boats will be brought into our paint shop”, Justine adds, pointing to a now empty area at the end of the workshop. Where the secret RM 1370 just left. We leave the large workshop. 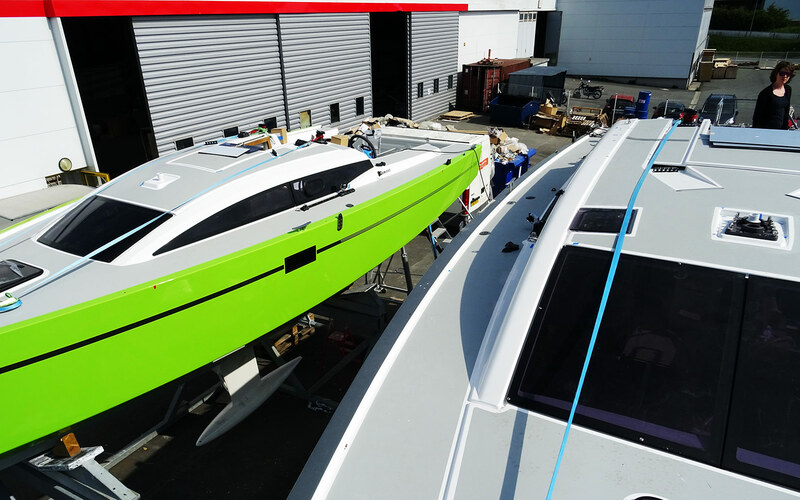 Two RM Yachts are on the outside to be fitted and rigged. An RM 1270 is the first we inspect. “All colours from the RAL-palette are possible”, Justine says: “We can even create tones if a client won´t find his favourite colour among the thousands of variants.” She smiles. “There´s always the one favourite colour not supplied by RAL, I can assure you …” We enter the 1270 and go down the entryway. What a nice big and light suffused saloon! “With every RM Yacht you will only have to make three steps to enter the saloon”, Justine insists. What impressed me (again) was the sheer light suffused saloon. Wow, that´s almost as spacious as on a deck saloon yacht, I tell her. She agrees: “Yet it isn´t a DS. We achieved to offer almost a 360 degree view of the surrounding which is fantastic when sailing.” I can only imagine. Partially this fantastic situation is due to the huge skylights in the fore part of the saloon: These large windows allow huge amounts of light entering the saloon for sure. “It´s wonderful to see the sails in full bloom. Even when sailing with autohelm, you´ll have a perfect view to what´s happening around and in front of you from down below here”, Justine adds. 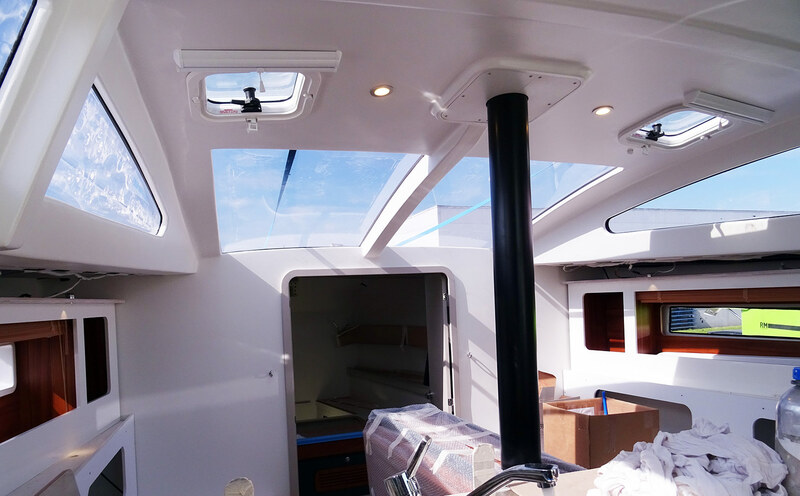 Just like windshields of modern sportive cars the RM Yachts bear this feature: As I stand outside on the fore deck of the 1270 I can compare this 34 feet boat to the nearby RM 890, the smallest in the RM range, that also have these large skylights. Light is even more important the smaller a yacht will be, so that is well done, Marc! Proper nav-station with chart table. Love this! I conclude the tour oft he RM Yachts facilities with a chat about the efforts which go into these boats. RM Yachts is making around 40 yachts per year, which is more than I thought. “We like to produce more and this year there will be a slight increase in the amount of units sold, but growth is not our primary goal”, Justine assures me. 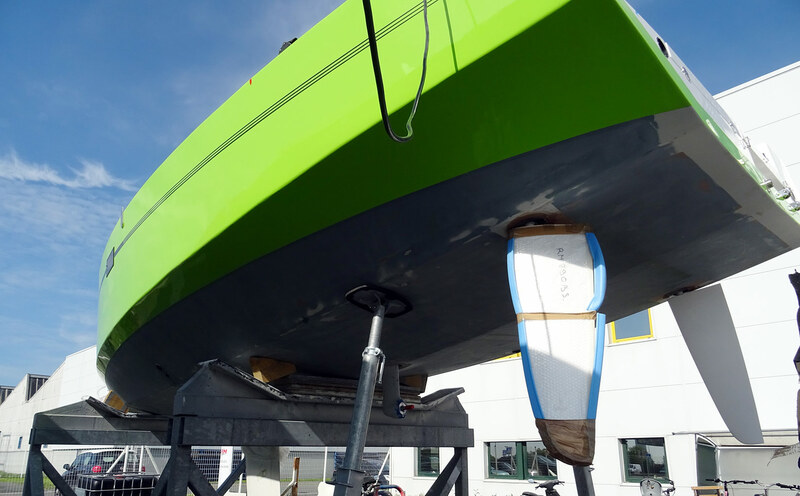 “We want to keep our high standards of quality both in the building of the boats as well as in their sailing abilities.” She is proud to tell me that when they´ve tested the RM 890 against the all new Pogo 36 (read it here), at this very day, the RM was faster. She will be fast, indeed! All this comes with a price tag of course. Making a yacht is always almost solely paying for handmade craftmanship. 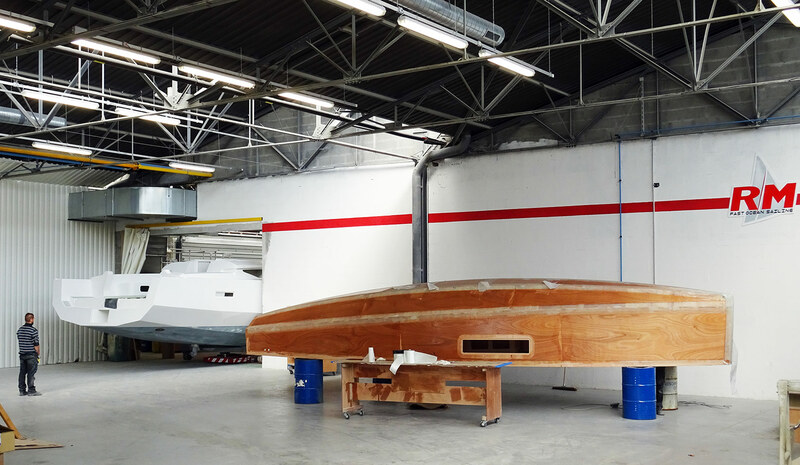 That´s no different between a GRP-made boat to these plywood yachts. Nevertheless, as Marc Lombard told me, the price for a plywood-epoxy-hull is around 20 per cent higher than compared with a similar hull made of GRP alone. RM Yachts is definitely an exclusive brand and therefore these boats do cost. In sheer numbers: One meter of the RM 970 does come in at some 14.900 Euros. A Pogo 36 will be slightly cheaper, 14.700 Euros. The Dehler 34 will come in at 12.000 Euros per meter, the Oceanis 35.1 at 10.800 Euros. 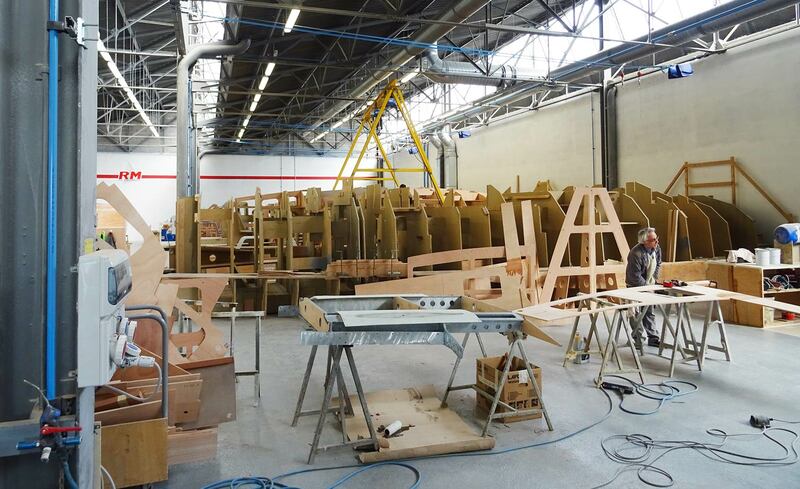 So there´s the difference, some 25 to 30 per cent to the production boats. Perfect yacht. Perfect day. Thanks to RM. 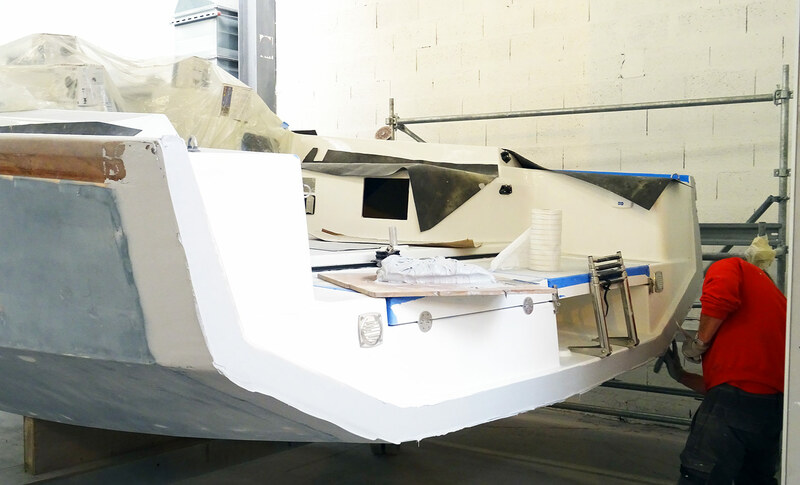 In the end I did have some very, very interesting two hours at RM Yachts workshop in La Rochelle with my wonderful host Justine who allowed me to take a free look at everything that was of interest. 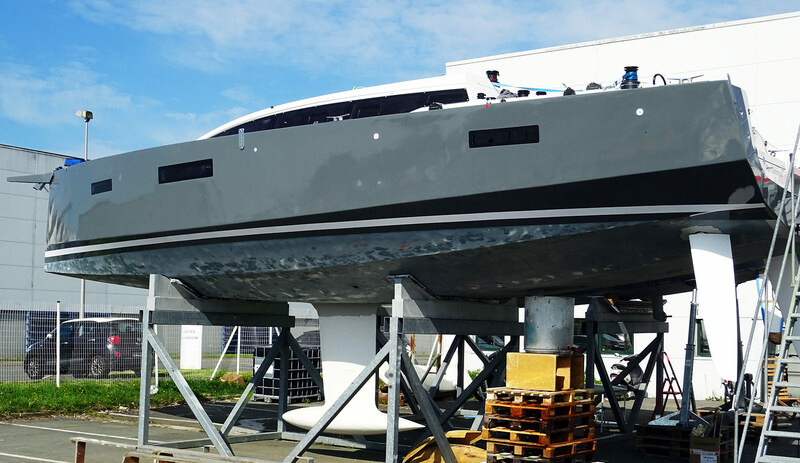 I was offered to look behind every corner, to turn things upside down (but to avid making pictures of the brand new RM 1370 – which I however did and will publish another article on this yacht when RM has officially launched the boat in the coming weeks. Thank you so much, Justine, thanks RM for having me as your guest. All that remains is the longing for an … at least small … RM Yacht (I´d take the green one) and maybe I will get the chance to sail one of these at the German RM-dealer not far from where I live. this is a fantastic article…. I have an 890 and saw her built from day 1 – I saw her ‘born’. I don’t regret having an RM at all. the factory is great and so are the people. I went to marc lombard’s bureau and met eric levet. I went for the deep keel twin rudder version – she is kept in gosport. this boat will sail herself (just let go the helm). I’ve had beneteaus, dehlers over the years – the little RM is the favourite…..
thanks for your contribution. Yeah, RM Yachts was a pleasure both by watching those fantastic yachts being made and from the human standpoint. Loved being there indeed! The steel cage doesn’t look to be made of stainless steel. It looks hot-dipp galvanized steel, but I might be wrong.